Criminologists have known for decades that income inequality is the best predictor of the local homicide rate, but why this is so has eluded them. There is a simple, compelling answer: most homicides are the denouements of competitive interactions between men. Relatively speaking, where desired goods are distributed inequitably and competition for those goods is severe, dangerous tactics of competition are appealing and a high homicide rate is just one of many unfortunate consequences. 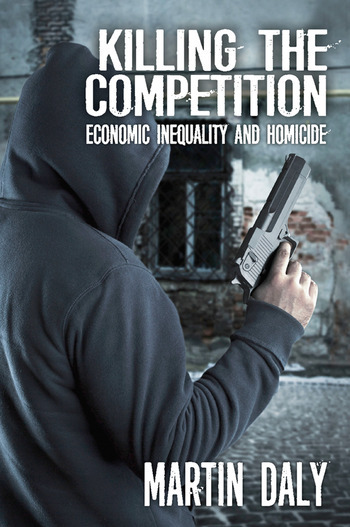 Killing the Competition is about this relationship between economic inequality and lethal interpersonal violence. Suggesting that economic inequality is a cause of social problems and violence elicits fierce opposition from inequality's beneficiaries. Three main arguments have been presented by those who would acquit inequality of the charges against it: that "absolute" poverty is the real problem and inequality is just an incidental correlate; that "primitive" egalitarian societies have surprisingly high homicide rates, and that inequality and homicide rates do not change in synchrony and are therefore mutually irrelevant. With detailed but accessible data analyses and thorough reviews of relevant research, Martin Daly dispels all three arguments. Killing the Competition applies basic principles of behavioural biology to explain why killers are usually men, not women, and counters the view that attitudes and values prevailing in "cultures of violence" make change impossible. 4 Inequality, or Just Poverty? 10 What Keeps Competitive Violence in Check?